Food & Wine What tools do you really need in the kitchen – and which can you do without? What tools do you really need in the kitchen – and which can you do without? Which knives are essential – and which are not? What's the proper way to use a cast-iron frying pan? What are non-stick pans best for? Is an air fryer worth the investment? What’s the difference between a wet and dry measure when baking? What are the essential cookbooks any home cook should own? Are your cupboards full of kitchen gear you never use? Feel frozen when faced with the array of choices in pots and pans and knives? Lucy Waverman has you covered with answers to all your questions on cooking tools and equipment. If you need some advice on cooking and entertaining, send it by e-mail. And look out for more Globe and Mail guides to kitchen life. The workhorse of your kitchen, knives can last you a lifetime, so it’s worth investing in quality. I inherited my grandmother’s carbon steel chef knife, which keeps a clean edge to this day, one better than some of my newer knives. Carbon steel stains, however, and must be looked after properly, so I would not recommend buying one. Knives come in all sizes and prices. 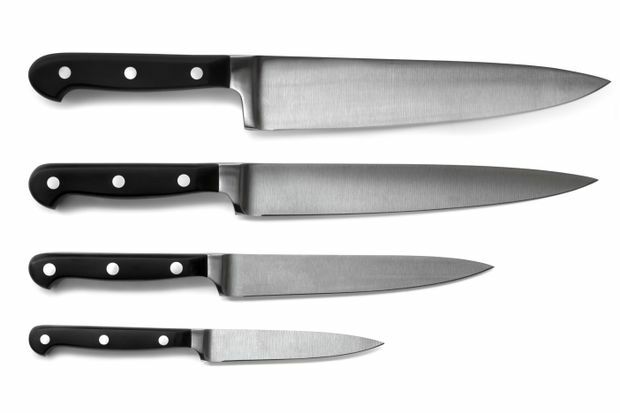 A bare bones set should include a chef’s knife, a small serrated-edge knife and a paring knife. There are dozens of additions you can make, such as a good slicer, a boning knife, a cleaver, a santoku or a long serrated-edge bread knife. Buying knives is highly personal. It is about the feel in your hand and the price you want to pay, but don’t skimp on this important kitchen tool. As more couples and families cook together, I would suggest buying two quality knives: a standard chef’s knife and a santoku, or Japanese chef’s knife. These are the basis for all good kitchen work. They will chop, dice, mince, slice, take apart a chicken or clean a fish. I find the 8-inch length for a chef’s knife and 7-inch for a Santoku works for most hands, but it is a matter of personal preference. Some brands will feel more comfortable than others. Try holding several until you find one that feels right. Keep your knife sharp, as it will bruise the food it’s cutting if it is dull and you are more likely to cut yourself. One of my favourite knives is a Japanese santoku with a rounded end, more like a cleaver. I find it efficient for most tasks and mine has hollows cut into the knife blade, which is known as a Granton edge. I find that it picks up food more easily to be transferred to a pan. My personal favourite is the Zwilling 7-inch Santoku Pro. It has a thin edge, better for slicing, and it fulfills most of my chopping, slicing and dicing needs. I like the rounded end for most tasks, although the pointed end of a chef’s knife has its uses when you are cutting up chicken or boning fish. Serrated knives, with their tiny serrations, are used for cutting fruit, tomatoes and chocolate. Long serrated knives cut bread and cold meat. They stay sharp for a long time. And paring knives are used for paring skins off fruits and vegetables. You’ll also need a honing steel. Run the straight-edged knives over the steel every time you use them for a perfect edge and have them professionally sharpened at least once a year. One caveat: Do not buy a knife rack full of knives no matter what the price. You won’t use some of them, so why pay for them? Buy knives individually. What’s the proper way to use a cast-iron frying pan? I am a big fan of cast-iron cooking. The pans, which can go from stove to oven to table, are efficient and last forever. Cast iron is an ideal cooking surface for anything that needs a good sear, like a sizzling steak, and it is also perfect for roasting a chicken or baking lamb chops. But, sadly, our cast-iron pans seem to hide away in cupboards, far from the action, because there is a notion that they need special care. There are a lot of myths about cast iron, so let’s dispel them. Most pans today come pretreated, but I prefer to give them another seasoning. Wash the pan with a little water and dry it well. Soak a paper towel with vegetable oil and rub it all over the pan – up the sides, even over the handle. Keep swabbing until the pan has a sheen. Heat the oven to 350 F (180 C). Place the pan upside down on the middle oven rack (put some foil on the rack below to catch any drips) and bake for 1 hour. Turn off the heat and let the pan cool down inside the oven. It is now ready for cooking. 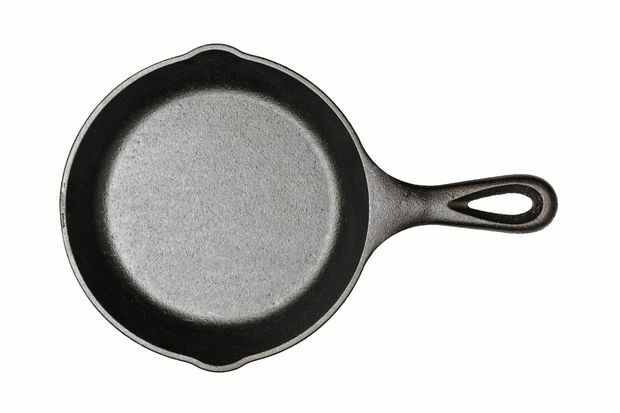 A popular myth is that you don’t wash cast-iron pans. But you do. Wash with warm, soapy water after each use and dry immediately. For a newer pan, rub on a little oil before storing, but you don’t need to do this once the pan matures; it maintains its own surface. Don’t use metal scouring pads. If food is stuck, sprinkle on a layer of kosher salt and rub the pan with a cloth. Salt is a wonderful abrasive. Why go to all this trouble? Cast iron is superb for searing everything except delicate fish. Meat attains a deep hue, for that braise you are making or the steak you are frying. 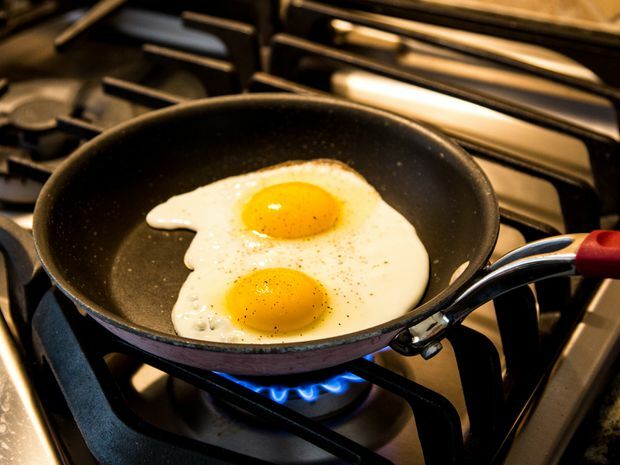 A well-seasoned pan makes perfect fried eggs. Cast iron is wonderful as a wok, and also a deep fryer since it holds the heat so well. Fry some chicken in a cast-iron pan and you will be amazed at how wonderfully juicy and tasty it is. Start the pan on a low heat and raise the temperature to high once the pan is hot. This way it heats evenly and stays hot, hot, hot. Cast iron comes in a variety of prices. One of the easiest brands to find is Lodge, which is in the mid-range price. Fancier and even heavier is Finex, which I use all the time as a roasting pan, deep fryer and serving vessel. Check online for availability in your area. Go find that pan you hid, reseason it, and enjoy the ease of cooking. An extra bonus: The weight helps you build arm muscles. Non-stick pans are light, easy to clean and do a good job on certain foods, but I don’t recommend them for most cooking. They do have their uses, though, but they must be treated properly. These pans are good for cooking eggs, pancakes, crepes, fish and things such as grilled cheese or quesadillas, where the cheese tends to leak out. They are useless when making sauces, though, because the coating will not allow those sticky caramelized bits to adhere, which you need for a proper, rich sauce. 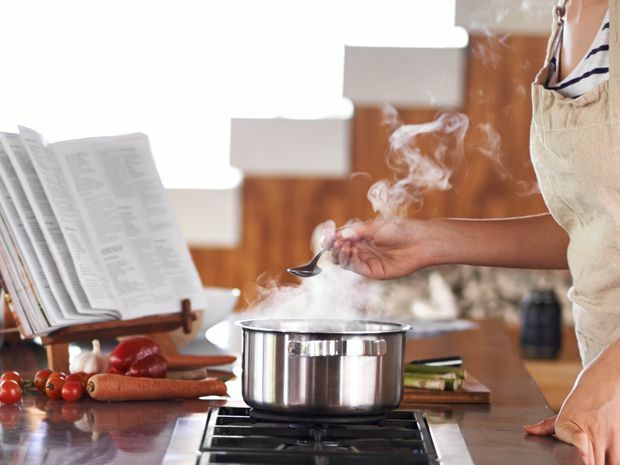 If you are making a reduction with wine, stock or butter, the sauce will not amalgamate properly in a non-stick pan because the coating is non-porous and does not conduct heat very efficiently. When using these pans, oil is needed regardless of what recipes tell you. A very thin coating helps to give colour and flavour. There is much written about the safety of non-stick pans. The fact that the material used for coating can flake into the food and be ingested has been a turn-off for most people. This was true about older pans, but today manufacturers stick to approved substances, such as silicone-based finishes. Having said that, don’t use your non-stick on high heat or put it in a hot oven unless recommended by the manufacturer. Always make sure you have food in the pan when it is heated. High heat will eventually ruin the surface and the pan will warp. Use it for food that needs low to medium heat. Don’t stick these pans in the dishwasher; the harsh chemicals will eventually destroy the coating. When hand washing, don’t use abrasive cleaners or a steel-wool pad. Dish soap and a sponge work wonders. Throw out scratched or chipped pans; otherwise, you may find bits of coating in your food. And don’t use cooking sprays on them, as they build up in the pan and become impossible to remove. Don’t buy sets even though it might seem like a good deal – you won’t use half the pans. While price is a factor, the best non-stick pans I have found are the new Le Creuset toughened non-stick, which feature a PFOA-free, triple-reinforced, non-stick coating that won’t chip or flake, making it worth the investment of just under $200. They’re also dishwasher-safe, oven-safe up to 500 F, and will last forever if treated properly. Labour-saving cooking devices have been a constant on the market for the past 50 years. The microwave became a must-have household item in 1967, growing in popularity over the decades. The first household food processor, the Cuisinart, was introduced in the early seventies. Since then we have been flooded with gadgets: slow cookers, Instapots, sous vide machines, ice cream makers and the air fryer. All designed to make life easier in the kitchen. I am not much of a device user – a good chef’s knife and a hand blender see me through most cooking situations. But I became interested in the air fryer because it touted lower calorie meals with that crisp, deep-fried taste, a quick cooking time, no mess and easy cleanup. I watched Gordon Ramsay demonstrate the air fryer in New York and was quite taken with the results, or maybe it was his charm. Either way, I got one. Here is the first problem: storage. The air fryer is like a bulbous convection oven. It is big and heavy. You must move more important countertop appliances, such as your kettle, to make room, or have basement storage, which makes it less convenient. The interior space is too small to do a lot of cooking at once. It does not fit a chicken unless it’s under 3 pounds. It makes dynamite chicken thighs, but only four at a time. 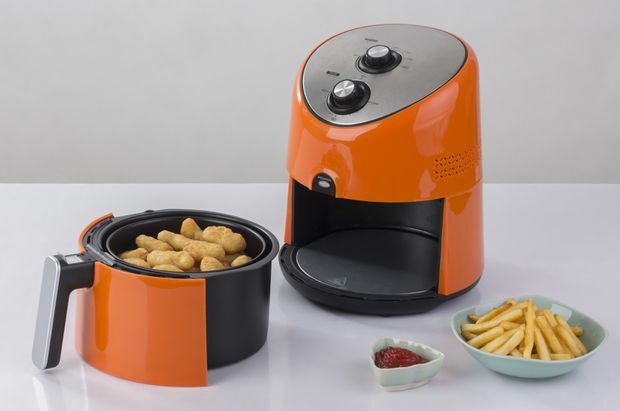 It successfully cooks fingerling potatoes, cut up sweet potatoes and other vegetables, albeit in small quantities. It also does a good job with pastry, browning it well, but a six-inch tart is the biggest you can fit. And then there is the fan noise. It can drown out all conversation. I decided to test chicken thighs in the oven and in the air fryer. I brushed them with some herbs and oil and put four in the air fryer and eight on a rack over a baking sheet (similar to the air fryer setup) on the convection setting of my oven. The air fryer takes no time to heat up, a positive, so my thighs were ready a good 20 minutes before the ones in the oven. Both sets of thighs were crisp and juicy, but I was able to double the quantity in the oven. In my second test, with French fries, there was little difference in the results, but I could do more in the oven and listen to the radio at the same time. If you are cooking for one or maybe two, an air fryer could take the place of an oven for a lot of your needs. For a larger family, stick to the oven. I often get questions from readers about why their cakes don’t work when they follow the recipe exactly. Baking is a scientific process; there are rules to ensure the final product is delectable. You can throw things together when you are cooking, but not when you’re baking. The most important step is measuring. It is much easier and more accurate to weigh ingredients for baking, but many people do not have scales and many North American recipes are based on volume (cups), not weight. If you are a serious baker, buy a scale and ignore this advice. But many food magazines now give baking measurements in both weight and volume, and to further complicate things for the rest of us, there is a difference between wet and dry measures. Glass or plastic measuring cups shaped like a jug are used for measuring liquids. This usually means eyeballing the liquid until it reaches a certain line. 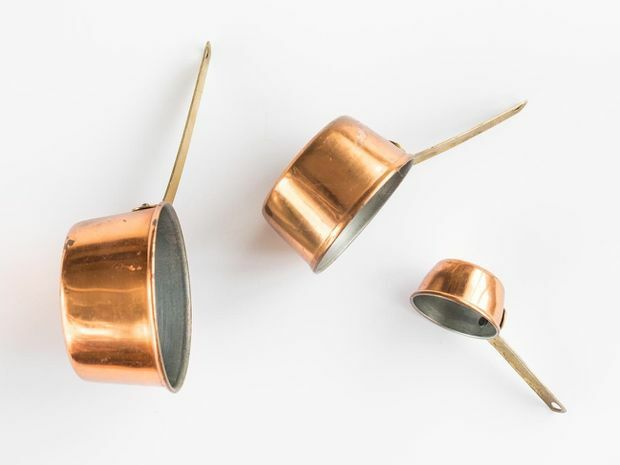 Dry measures are the stackable cups that come in different sizes. These are essential for accurate measuring. Do not use wet and dry measures interchangeably. To avoid baking nightmares, it is important to measure your flour correctly, which depends on how you scoop it into the cup. Most bakers spoon the flour into the measuring cup until it is piled high. Sweep the back of a knife across the cup to level it – this is the correct measurement. An alternate method is to whisk the flour gently or break it up with a fork to lighten it. You may wonder why. In older recipes, flour was sifted before measuring, which aerated it. Today, flour is “presifted,” but it packs back down in the container. If you plunge your measuring cup into the bag of flour, scoop it full of flour, take it out and level it, you get about 2 to 3 tablespoons of extra flour. In a two-cup cake, that means an extra 1/4 to 1/3 cup of flour – the difference between a perfect dessert and a stodgy failure. To test my theory, I weighed 1 cup of flour using both the “scoop” and “spoon” methods. The scooped flour weighed 150 grams, while the flour that I spooned into the measuring cup weighed 130 grams. If you measure properly, say goodbye to failures and enjoy perfectly baked treats. I go back to certain cookbooks time and time again. The recipes are original, and the techniques are infallible and can be used for more modern approaches. Each time I use them, I learn something new. Most important, however, is that they really work. There are many more, but these books are essential. Before I trained professionally, I learned to cook with Julia Child. I lived in Cambridge, Mass., as she did, and we all felt her aura in the neighbourhood. She was my hero. Her first book, Mastering the Art of French Cooking, was perfection. Although the recipes covered pages and pages, you could never go wrong. If you want the right way to do a French dish, Julia is still your guide. Her The Way to Cook is a little less daunting. For Italian cooking, I feel the same way about Marcella Hazan. Her Essentials of Classic Italian Cooking is just that. No pictures, just the ones in your head when you make her authentic dishes. In 1982, the cookbook world was challenged by a new concept – not just of recipes, but of style. For the first time, sidebars appeared and The Silver Palate Cookbook became an instant bestseller. Its classic Chicken Marbella appeared at every dinner party. Even the esteemed Yotam Ottolenghi gives it a nod with his much-updated Chicken Marbella in his new cookbook Simple. In 1995, an essential book by Canadians Naomi Duguid and Jeffrey Alford appeared. Flatbreads and Flavors: A Baker’s Atlas was a travelogue, cookbook and a cultural exploration. New and diverse recipes explored the basics of life, breads and their accompaniments. Madhur Jaffrey is next on my list – my go-to for Indian techniques and recipes. Her first and most interesting book, An Invitation to Indian Cooking, came out in 1973 but has since been reissued. Julian Armstrong’s Taste of Quebec is a must-read culinary journey exploring foodways and traditions through the province of Quebec. Her latest book, Made in Quebec, goes even deeper. I love Nigella Lawson’s early books, namely How to Eat, which has just been reissued, and How to Be a Domestic Goddess (mainly about baking). She was and still is a breath of fresh air as she encourages people to just relax and enjoy the eating and cooking of food. Another personal favourite is Nigel Slater, who writes so vividly that you can practically eat the food off the pages. His recipes are uncomplicated and give you flavours that require real imagination to provide. All his books are still in print. For vegetarian, I always go back to Deborah Madison. Her more recent compendium The New Vegetarian Cooking for Everyone delivers recipes with style and substance, including any vegetable you may not be familiar with. When I want answers, I go to Harold McGee, whose book On Food and Cooking should be in everyone’s library. He gives you the science behind cooking for greater understanding of how food works. Ottolenghi made Middle Eastern cooking accessible to the world with his understanding and use of spices accentuating full-flavoured, fragrant recipes. He has a welcoming style, and while his recipes can be complicated, his latest book, Simple, features easier dishes. This list is not complete without Salt, Fat, Acid, Heat by Samin Nosrat. An innovative book on how to cook through exploring the elements, it makes you feel the joy of cooking. A future classic. As for desserts, my heart belongs to Richard Sax’s Classic Home Desserts, with wonderful recipes that always work.